@fluffypillow No worries. I know there's a ton that needs to be written, but where is pegasus looking for the game pictures? I load my games from usb, and pegasus sees the games, but no pictures. Games are in /media/usb0/, and pictures in /media/usb0/system folder/images/ and ES uses them. Also, my snes pad is seen as analog, and I can't bind buttons. Is it possible in this build? @sselph Ah ok, is your scraper going to be updated to support pegasus's naming scheme? @Darksavior looking at the code it doesn't look like the default -image suffix that my code and ES uses works. If you remove the suffix it may work. FYI I haven't actually used the code just inspecting the code to figure out how I could integrate with it. @sselph Thanks again. I'll have to wait when you decide to change your scraper's naming scheme to be compatible. Lots of renaming if I do it manually, heh. -boxFront is for the cart, -screenshot for the left half of the screen(I used the cart pic again). -video works without renaming, yay. There are tools for batch renaming files, for example you can run rename 's/-image.jpg/.jpg/' * in the image directory. @fluffypillow Yeah, I'm renaming my images in windows since I also scrape on that. Crashes and freezes galore:) Looks amazing, though. A small taste of what it'll be. I know this is an alpha so I'll try not to post at github about these issues so early in dev. Scrolling with videos causes the freezes. Some videos are distorted. The systems without videos seems to be fine. I'm using sselph's scraper in windows with handbrakecli.exe to auto downsize them for the pi. I won't use videos for now. Loading a game is another adventure. It'll randomly boot me back to pegasus after 15+ seconds. Then, if I go load the game again, it takes me back to where I was in the game. Crashes with exit code 15. I also need to use my kb since pegasus sees my snes pad's dpad as analog. The dpad won't respond. I'm sure once the ability to change controls is implemented, this will no longer be a problem. I added some systems myself, but not sure how to do add the logos for those. The retropie system page has no icons. @sselph Sorry to bother, but is your scraper working to get logo art from screenscraper.fr? Maybe I'm doing it wrong. I can only get the logos from gdb, but they're not transparent like ss's. SS does have three different kinds of logos, so maybe I thought I'd need to type some more strings. @fluffypillow I must've spent the whole weekend trying to build this and still nowhere close. I've also never compiled in my life so it's quite the learning experience. Trying with Ubuntu, I'm following the pi cross compile tutorial you linked in your wiki with your configure settings. Qt creator doesn't seem to see qml, multimedia, quick, svg. It also says my qmake is "non-installed -prefix build - for internal development only"
Installed qt5, qtdeclarative, qtgamepad, qtmultimedia, qtbase, qtsvg, few more I can't remember. If I use the main package from https://launchpad.net/~beineri/+archive/ubuntu/opt-qt59-xenial then qtcreator wont complain but it won't create a working build. Pi refuses to run it. @Darksavior yeah Qt can be quite complex, and not necessarily the best first time experience :) I've never seen that error before, but you could try using this Qt build I've made. I'll also set up an automated nightly build system tomorrow, so you won't have to rebuild every time there's a change. Ok, the very latest builds are now available here, and are updated on every new commit of the master branch. Could it be possible for Pegasus to have an overlay-option for some games, or will overlays work the way it does today? In non-coder terms, what's the current status of this project? @fluffypillow let me know if you'd like translations to danish - I'd love to contribute in some way, but I guess other languages is pretty low-priority. @AndersHP by overlay, you mean a global GUI overlay that would pop up when you press a key/button combination? Like with Steam, Kodi, and on consoles? I'm not sure if it'd be possible on the Pi, (as far as I know) when you're running an emulator, it owns the graphical context of the device ("has the right to draw on the screen"), and I don't know if it's allowed for other programs to draw at the same time. It probably could be done on desktop/X11 though. What counts as a non-coder term? :) It's currently in Alpha, meaning some functions are usable, but many are missing, there could be lots of bugs, and the documentation is lacking. In short, it's incomplete but testable. Sure, translations are welcome! 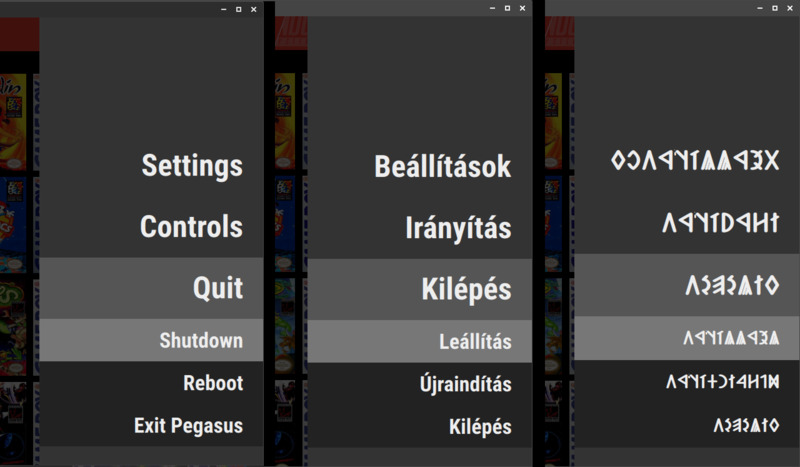 I'll write up a localization guide (there's even a nice GUI program for it), and translation context comments; meanwhile you can find the Hungarian files here. The changes and new files will be automatically picked up by the build system (well, as soon as I finish translation support). It's not necessary to translate every text, eg. console debug output messages, it'll fall back to English. Also since it's still in alpha, the text may change often, eg. when new features added and such. @AndersHP by overlay, you mean a global GUI overlay that would pop up when you press a key/button combination? Like with Steam, Kodi, and on consoles? No I think that would stress the Pi unnecessarily? I meant MAME overlays like bezels for vertical shooters etc. But maybe that's too early when the basic functionality is not 100% yet. When I browse with videos from screenscraper.fr's, pegasus eventually crashes. Bit of lag when browsing but when I downgrade them to 320x240 with sselph's scraper + handbrakecli.exe, some videos appear garbled for some reason. They play fine in ES. and a lot of "warning: "no volume control found""
(You may have already said this before but) what video player does Pegasus use? I think ES was using the VLC player but I believe they've moved over to the OMX Player with hardware decoding? That might be why @Darksavior's videos "appear garbled". @AndersHP ah ok, but isn't that a libretro setting? @Hevvie said in emulationstation systemd service: I had the same issue, what you need to do is put "<bool name="BackgroundJoystickInput" value="true" />" into your es_settings.cfg file as it thinks ES is running in the background. I will try this out when I get a chance. Great find!!! @BuZz said in ROMS to be downloaded on the RetroPi OS: However the problem we have isn't that. It's people selling/distributing RetroPie with thousands of other people's copyrighted games. Many popular open source emulator have this problem. It's going to be rather annoying if you plan on "clarifying" your point every time this comes up (And it won't have the effect you want ). I'm saying you need to be very clear that selling ROMs isn't inherently illegal when you talk about this. These companies know what they're doing is illegal and usually wrong as well but public perception on the legality of ROMs and emulators in general matters. Nintendo in particular has been spreading misinformation about this for decades because they want more control over the future of technology to belong to megacorporations like them and to change the law to make projects like RetroArch actually illegal. Just saying "selling ROMs is illegal" normalizes this impression which would make passing laws to that effect much much easier for them. I think if RetroPie was to distribute a facility to download ROMs that are legally in the clear, this might help dispel the misconception that sharing ROM files is inherently illegal. @pjft Thank you kindly, sir. The warm welcome means a lot, but there's no need to worry. I'm still somewhat swamped until after the holidays, but I do plan on keeping a tab open here to help out with the most recent round of spammers. Those guys are relentless. @kkokkinos There are a few GPIO based controller drivers available in RetroPie: https://retropie.org.uk/docs/GPIO-Modules/ https://github.com/recalbox/mk_arcade_joystick_rpi I think you're trying to use the mk_arcade_joystick_rpi one ? If so, then you need to install it first from the RetroPie-Setup script (it's in the drivers section of the packages) and then configure it - as described on the Github page of the driver. You can ignore all the installation steps and just look at the pinout and make sure you connected the wires correctly, then jump to the Loading the driver section. There is no recalbox.conf file in RetroPie, that is part of the Recalbox image -a different project. Glad it can be helpful for others!